There exists a long tradition of warming wine and fortifying it with fragrant, sweet spices, particularly during winter months, and as ancient Romans conquered much of Europe, they brought with them the traditions of viticulture. Throughout western Europe, you find variations on mulled wine recipes: glogg in Nordic nations often features bitter orange, cardamom and vodka; vin chaud in France features lemon; Hungarian forralt combines wine with spices and amaretto, while Moldovan izvar combines wine with honey and black pepper. Mulled wine is wine that has been fortified with spices, herbs, fruit and fruit juices, hard alcohol and a sweetener like honey or sugar or any combination of those ingredients. It is simmered long enough to allow the spices to infuse the wine with their aroma and flavor, before you ladle it into mugs and serve it nice and hot – about the temperature of tea or coffee. It’s an intensely warming drink, and so is often a welcome addition to the table during the winter holidays, and it is sometimes called “Christmas Wine” for this reason. Mulled wine includes red wine (though it is occasionally made with white) and fragrant and sweet spices like cinnamon, allspice, cardamom, star anise and cloves. It occasionally contains other sweet spices like coriander, anise and fennel, too. You can buy mulling spices, which are a blend of many of these spices, but you’re better off blending whole spices yourself which will give you better flavor and greater nuance than if you bought a mix. Some mulled wines also include herbs like bay leaf or elderflower, and many recipes call for further fortifying the wine with hard alcohol, like brandy, or a sweetener. Most recipes will also call for fruit, notably citrus fruits like oranges and lemons as those are in season during the winter months when mulled wine is typically made. 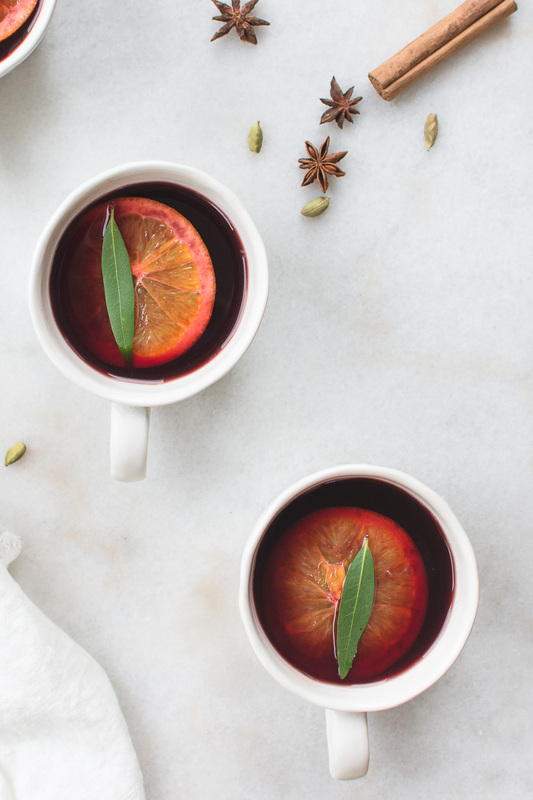 I use a variety of sweet and fragrant spices in my mulled wine recipe, and couple them with California bay which has a spiced, herbal flavor that pairs beautifully with citrus. Oranges, with flesh, rind, pith and all, bring brightness to mulled wine with the faintest hint of bitterness and it’s that hint of bitterness that stimulates the digestive process, making mulled wine a fantastic pairing for heavier meals like Thanksgiving or Christmas dinner. To make mulled wine you need to combine all your ingredients together – herbs, spices, fruit, sweeteners and wine – together and heat it hot enough to release the volatile compounds of the spices into the wine and long enough to truly infuse those flavors into the wine. And you need to do it without overcooking the wine or losing its booziness. After combining the ingredients in a pan, you’ll heat it until it begins to simmer, and then immediately turn down the heat low enough to keep it warm as all those flavors begin to mingle. Usually thirty minutes is enough to suffice. And while you want to give time to allow all the spices to release their aromatic oils and flavors into the wine, if you let them steep too long, your mulled wine will develop bitter notes and a distinct perfuminess that’s better left to potpourri. The flavor of your mulled wine depends largely on two factors: the quality of wine you use and the quality of spices you use. And while you can pick up mulling spices at any grocery store, often those spices are of poor quality; they’re rarely organically grown or produced through fair trade. What’s more, they’re often stored in clear glass jars for a lengthy period of time which means loss of flavor and potency. Alternatively, you can buy high-potency, fresh herbs and spices online here through Mountain Rose Herbs that are also organically grown and fair trade. Simmering wine with oranges, spices and honey together for this mulled wine recipe is one of the easiest things you can do during the holiday season. 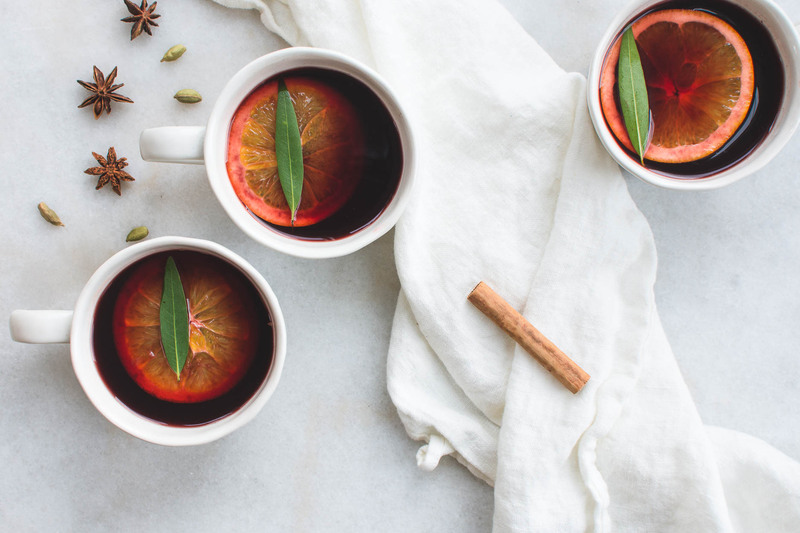 This mulled wine recipe produces a deeply fragrant, faintly sweet fortified wine that's lovely on a cold winter day or around the holiday table. You can order organic mulling spices online here. Pour the wine, cider and brandy into a large sauce pan set over medium-low heat. Whisk in the honey, and when it dissolves, toss in the sliced orange, spices and bay leaves. Allow the wine to simmer over medium-low heat for thirty minutes, and then strain the wine through a fine-mesh sieve as you ladle the wine into mugs. If not consuming all the wine right away, turn the heat on the burner down to low and allow it to keep warm. Slow Cooker Variation.Combine all ingredients in a slow cooker set to low heat and warm for one hour before serving. Mulled wine is only as good as the wine that goes into your pot. And while it’s tempting to buy a cheap wine of uncertain quality to mull, since you’ll add oranges, honey, and spices, those ingredients can’t mask a bad wine. It’s worth your time to invest in a good quality wine with a decent rating and, fortunately, many good wines come with affordable price tags. I order wine here, where you can search for sustainably produced, highly rated wines at a good price. For mulled wine, you want a medium- to full-bodied red wine with strong notes of berry and red fruit. Since we’re adding potent, fragrant sweet spices, a medium- to full-bodied red will hold up nicely against the strength of those spices while notes of berry and red fruit will complement mulled wine’s sweet, fruity additions. Zinfandel makes a particularly nice choice. Before serving mulled wine, you should strain it to remove any whole spices or herbs. Serve it warm, about the temperature of hot tea or coffee. It pairs beautifully with roasted meats, like Slow-Roasted Turkey or Maple Citrus Turkey. You can also serve wassail as a dessert wine, provided the sweets you make are rich in complementary spices like Gingerbread, Molasses Cookies or Sugar Plums. If you’re not sure Mulled Wine is right for your Christmas table, you can always make a boozy wassail, spiced ale or spiced cider. How many bay leaves? I do not see them listed in the ingredients. 2! I’ll have to fix that. Why does one need sweet apple cider when the recipe calls for 1 cup of sugar as well? This recipe sounds so good, but I worry about how sweet it might be. Well … mulled wine is supposed to be sweet. If it concerns you, an easy solution would be to add sweetener to taste. Drinking it now and this is amaaaaaaaazing! I put half a cup of honey instead of the full cup, and I’m finding that level of sweetness is better for me (I’m not a huge sweet tooth) – it’s still quite sweet! This recipe looks lovely – bay leaves are mentioned but not listed with the ingredients. How many would you suggest? I would like to make a batch soon ! How could you adjust this recipe to be non-alcoholic? Alcohol is central to the recipe, so I wouldn’t recommend making adjustments. You could look for a mulled apple juice, though. Sounds delicious! I might give this a go in the slowcooker. I’m guessing it may take a few hours for the spices to infuse vice the hour on the stovetop…any thoughts? Please share what brand of Apple cider you purchase for this recipe. Thanks! Oh I don’t think brand matters significantly for sweet cider. Use what’s available locally to you. I was wondering if this could be prepared in a crockpot. Has any one tried? I am making this tonight and your Buch De Noel! So excited 🙂 Thank you. This sounds amazing! I can’t wait to make it for our holiday get together. Could this be made in the slow cooker? It sure can! I often do. Any idea how long this could keep for if i put it in tje fridge after making it?